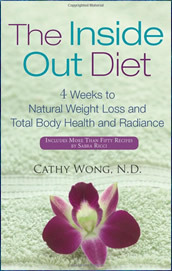 The Inside-Out Diet: 4 Weeks to Natural Weight Loss, Total Body Health, and Radiance is written by Cathy Wong, a naturopathic doctor and nutritionist. Wong claims that a healthy liver is the key to losing weight and overcoming illness. Her 4-week program concentrates on supporting optimal liver function by adjusting the diet to promote cleansing and detoxification. For the first week you will eliminate all foods containing dairy, wheat and gluten. Wong explains that this will help the body to detox but she advises against extremely restrictive cleansing diets because this causes an excessive release of toxins, which overloads the liver. This liver cleansing diet for the first week is based on fruit, vegetables, organic poultry, egg whites and gluten free grains. One cup of coffee is permitted each day. Several nutritional supplements are recommended including essential fatty acids and a multivitamin. In the second week you start to introduce one of the foods you eliminated back into the diet each day. This process can help you to identify the presence of food intolerances or other negative reactions to certain foods such as weight gain or bloating. Once you have identified any problem foods you will continue to avoid them for at least two weeks, however you can continue until you have achieved your ideal weight. Following this, Wong provides a maintenance plan designed to help dieters sustain their weight loss and stay healthy. The Inside Out Diet includes a 28-day meal plan and recipes with options for either 1200 or 1800 calories a day. Additionally information and techniques for stress management, better sleep and relaxation are provided. Whey protein, flaxseed, broccoli, kale, blueberries, beets, garlic, lean organic meat and poultry, organic eggs, tempeh, almonds, beans, avocado, coconut, quinoa, brown rice. Exercise is recommended because it improves your capacity to lose weight and can improve the health of your liver. Dieters are advised to exercise for at least 30 minutes each day. A combination of aerobic exercise and resistance training is preferred but dieters are encouraged to do any physical activities that they enjoy and fit into their lifestyle. The Inside-Out Diet: 4 Weeks to Natural Weight Loss, Total Body Health, and Radiance retails at $24.95. Concentrates on liver health and detoxification as well as weight loss. Appeals to dieters who have been unsuccessful losing weight with conventional diets. May assist with the identification of food intolerances. Includes a 28-day meal plan. Includes recipes created by celebrity chef Sabra Ricci. Meal plan does not include vegetarian options. Some of the recommended liver cleansing foods may be difficult to find. The Inside Out Diet is a gentle approach to a liver detox diet that can assist dieters to lose weight while simultaneously improving their health. It will appeal to dieters who have had limited success with conventional diets and are experiencing chronic illness, reduced vitality, or liver issues.